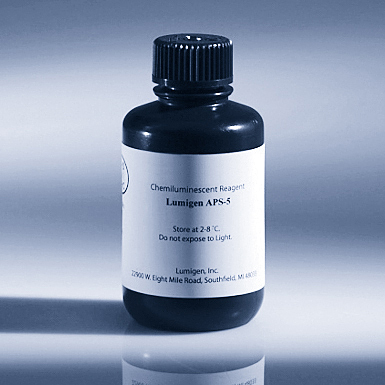 Lumigen APS-5 is a proprietary acridan based chemiluminescent substrate for ELISA detection of alkaline phosphatase (AP) conjugated molecules. The unique acridan chemistry of Lumigen APS-5 provides temperature insensitive light output and more rapid peak intensity as compared to the dioxetane based AP substrates, Lumi-Phos 530 and Lumi-Phos Plus. The light-output peak intensity of Lumigen APS-5 reaches sustained maximum within seconds of substrate addition. Light emission is maximal at 450 nm. Lumigen APS-5 is available in 100 mL and 1 Liter volumes. Visit the Lumigen store to purchase on-line.